This is Dex. The Border Collie that I bought from Denise Rackley. Sharon and I drove to Indiana, (almost to Kentucky), to watch Dex work Denise's sheep, before deciding to buy him or not. Dex is fully trained and very good with the sheep. Denise's sheep are very used to being worked by dogs and seem very complacent about the whole ordeal. My sheep met Dex on Sunday and they were a bit more panicked about the situation. They are now getting used to the weekly round- up for inspection. Once a week Dex and I go and gather up the 3 pens of sheep, one pen at a time and check their heath, hooves, and coats. What used to take me several days to do now is done in one day. I used to have to call the sheep into the barn with grain, get the gate behind them shut, and than chase them around and check one, than chase again, check that one.etc etc... you get the idea. Now, Dex puts them in the barn, and holds them there. 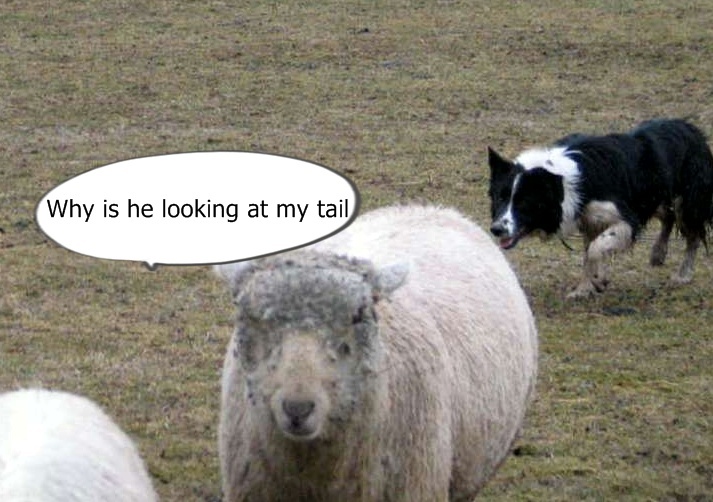 While he is "holding" the sheep, they stand stock still, and never take their eyes off the dog. I can walk to each individual and do what I need to do to them. They won't move a muscle while I change the coats. He also helps when I feed, as I used to have to get off tractor, open gate, keep sheep from getting out, drive tractor through gate, get off, shut gate, get back on tractor, drop hay, and do it all in reverse to get out of pasture. Now I open gate, send Dex, drop hay, drive out, tell Dex "that'll do", and shut gate. great time saver...I LOVE this dog. He must be a heck of a dog to meet your approval! He sounds cool! You are right...I have some pretty high standards...and expectations. Hello, Is it possible to reserve one of your covered Cormo fleeces? They are stunning! Hello! I just found you from a post in a Mi Knitters forum on Ravelry. Your black and white lamb is adorable and it sounds like Dex is a great addition to your farm. I'll be sure and watch for you at Mi Fiber Fest this year and if you're there say hello.